In 25 years orangutans will be extinct. The good news is that we can stop this from happening if we act now! This week is Orangutan Awareness Week, an initiative designed to raise awareness of the plight of these amazing creatures and to help stop their disappearance from this blue planet we call home. 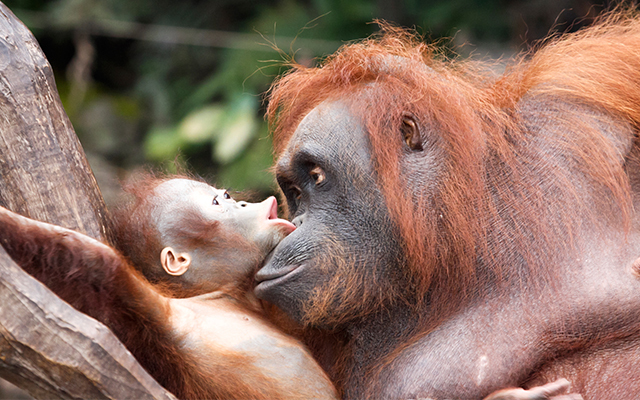 Smart, self-aware and emotional, orangutans share over 97% of the same DNA as humans making them our close cousins. 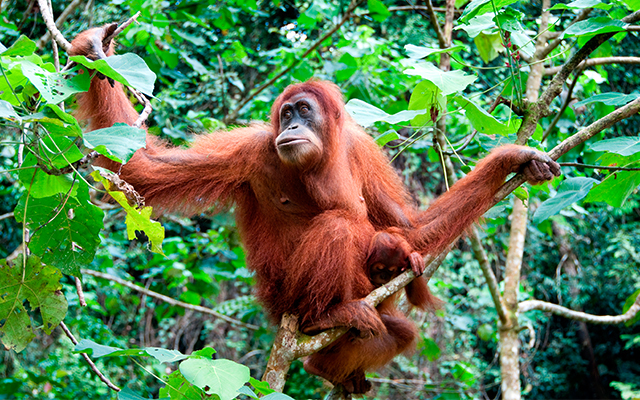 Even the name ‘orangutan’, translated, means ‘person of the forest’! 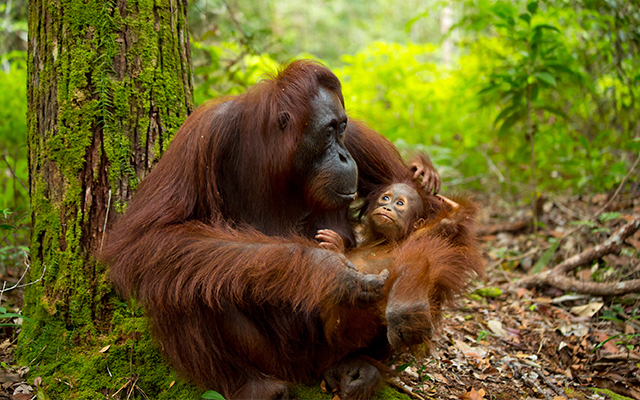 Able to reason and think, orangutans live in trees and, like birds, build nests! These clever apes are even known to make umbrellas out of big leaves to keep dry when it rains or to use as shade from the sun. They fashion tools to help them forage for food! They have even been known to chew leaves to make sponges when water is scarce so they can soak up bits of liquid from hard to reach places like cracks in trees. 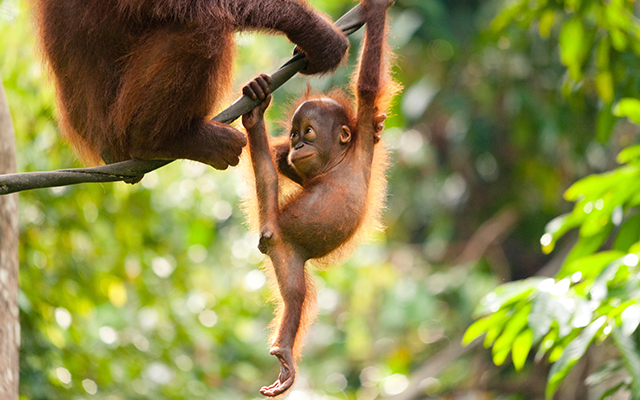 Just like humans, orangutans live long lives and are able to reach ages of 50+. They also have the longest childhood of any animal in the world, with babies nursing until up to eight years of age, after which they stay with their mother for a few years, with females staying well into their teens. Baby orangutans cry when they are hungry, get upset when they are hurt and even smile at their mothers! In fact, the orangutan has the mental and emotional capability of a six year old human child. Living solely in the forests of Borneo and Sumatra in Malaysia and Indonesia, orangutans eat fruit, bark and insects, and like humans, have opposing thumbs and a set of 32 teeth. Rangas have 13 – 15 different vocalisations and when not raising children, live mostly solitary lives. It is thought that this is the case because they have no natural predator so they never needed to group together for protection. At present things don’t look good for the orangutan. The world’s demand for palm oil is destroying their habitat and killing them at an alarmingly rapid rate. In the last 10 years alone humans have wiped out over 50% of the total number of orangutans. Currently there are only around 40,000 orangutans left in Borneo and 7,500 in Sumatra making them critically endangered. The first thing you can do is to stop buying products made with unsustainable palm oil. As it is cheap, this damaging oil is in everything from E10 petrol, to cosmetics, cakes, biscuits, bread, chocolate, chips, and laundry and cleaning products. Before you buy, check if the product has palm oil in it by looking at the ingredient list. In Australia, palm oil can be labelled vegetable oil and a number of other names. So to be sure you can check out lists of products made without palm oil by clicking here, or if the saturated fat content of the product is over 50%, it’s likely the ‘vegetable oil’ is in fact palm oil. Alternatively, you can download an app called POI for iPhone and Android which can scan your grocery items and tell you if they contain palm oil from unsustainable sources. You’ll also be doing your health a favour, with palm oil shown to be one of the worst fats for your body and health. Importantly, spread the word about palm oil and the plight of the people of the forest. Word of mouth is powerful, and you hold that power. If that is not enough action for you, you can always volunteer your time with places such as Greenpeace, or check out the work of The Orangutan Project. Alternatively, you could study to actually work with orangutans either in a zoo, a conservation park or in a rehabilitation centre. For those curious about what life working with an exotic animal such as an orangutan is like, Open Colleges got the scoop from Mogo Zoo operations manager, Paul Whitehorn. “I love the fact that no day is ever the same,” he said. “I’ve been a keeper for 27 years and I still can’t tell you exactly what my day is going to be like. It’s always challenging, but seeing the difference you can make in each animal’s individual life and also being able to help the species in some way is very rewarding,” he added. If you are thinking about getting more active in conservation efforts and studying to work with animals like the orangutan, Paul emphasises the importance of being able to read animals. “We can’t really teach that to people,” he said, adding “they’ve either got it or they haven’t”. A willingness to do hard work is also a must, with Paul saying “It doesn’t matter whether it’s 42 degrees or minus five and pouring with rain. You still have to get in there and get it done, so it can be very physically challenging”. “You have to be very driven and passionate about it as it’s not a highly paid profession. We do it because of our love for the animals and enjoyment of the job. You have to be flexible and accept that it’s not a 9-to-5 job; you’re going get to work early and leave late, but you’ll also enjoy every minute of it,” he added. For more information about palm oil visit the World Wide Fund for Nature by clicking here. If you want to learn more about The Orangutan Project click here. For more information about studying online to become a zoo keeper or work in a conservation/rehabilitation park click here. A Certificate IV in Captive Animals will equip you with the skills and knowledge to work in a zoo, wildlife sanctuary, conservation park or rehabilitation centre. Study online at your own pace and in your own time. Learn more by clicking here.